The unholy trinity of Cronos, Mantas and Abaddon released "At War With Satan" in 1983. It would be their third album and an attempt to take their music to the next level. Venom wanted to try and prove their technical abilities and song writing capabilities as musicians. The title track "At War With Satan" is a conceptual song in itself that clocks in around 20 minutes! Only progressive rock artists like Yes, Pink Floyd, Genesis and Rush were known for writing conceptual songs that could take up one side of a record. Venom were one of the first metal acts to take that route. It was both a pivotal move from a career standpoint since songs of a conceptual nature were too long, therefore, limiting airplay. They also took up valuable vinyl space that shorter songs could use, possibly ones that could be released as singles. In any case the end result of "At War With Satan" is brutal and violent yet complex with many time changes. It has thrashy parts, clean parts, mid paced, slow, etc. It's a song full of every tempo. The lyrical content deals with Armageddon; Hell's attack on Heaven. The second half of "At War With Satan" included shorter songs such as the Motorhead styled "Rip Ride" and the concert anthem "Stand Up And Be Counted". Their musical creativity really shows on the song "Cry Wolf"; a perfect example of how their music had matured without losing edge. There is even a track of utter noise and screaming, which is pure junk called "Aaaaaaarrghh!". It seems it was put on the album as more of a joke than anything. The album sold well enough and it should have taken Venom to the next level. Critics felt it could have been much more than it was. Commercially, it wasn't their big break. The one thing that was always missing from any of Venom's early releases was quality production. The bass always seemed louder than the guitar and the overall sound was thin and treble like. The drums sounded like someone banging on a bunch of pillows. But compared to "Welcome To Hell" and "Black Metal", it was a big improvement. This remastered version gives the album new life and some overall improvement. It also includes a bunch of songs that were recorded during the "At War With Satan" sessions that never made it to the album. They were released as singles. Some of the songs include "Warhead", "The Seven Gates of Hell", "Manitou", "Woman", "Dead of Night", and "Lady Lust". Many of these songs were some of Venom's best. Also included are extensive liner notes, lyrics and pictures. 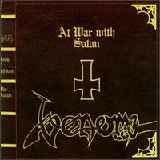 "At War With Satan" was my very first Venom album. I bought the original version back in the 80's and it took many listens for this album to grow on me. Surprisingly, it has found a place on my listening rotation. "At War With Satan" contained some of Venom's best material at the time. The band has improved over the years as musicians with each album. Their last release, "Resurrection" is by far their best produced, best written and heaviest album to date.